Human Directionals / Human Sign Spinners. There is no denying it…Human Sign Spinners are a very effective marketing tool for any business looking to increase sales. Studies show that traffic increases up to 75 percent each day when human directionals are utilized. Why is this so effective? We capture the attention of traffic in a very unique way. It is easy to ignore a billboard or a stationary sign because we see them all the time. However; a human directional is a live, energetic human being that demands attention, and gets a great deal of exposure. 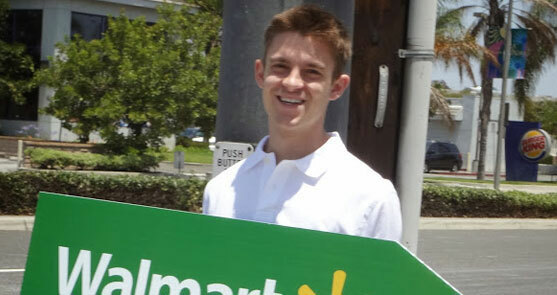 What Companies Use Human Directional Signs? Human Directionals, or Sign Spinners are an ever increasing popular way to advertise. If you are feeling unsure about this effective form of advertising, give us a 3 week trial and monitor the traffic. We are confident you will immediately see the effectiveness of this unique advertising medium. Don’t know what you want your sign to say? No worries, let our team of professionals help you every step of the way. 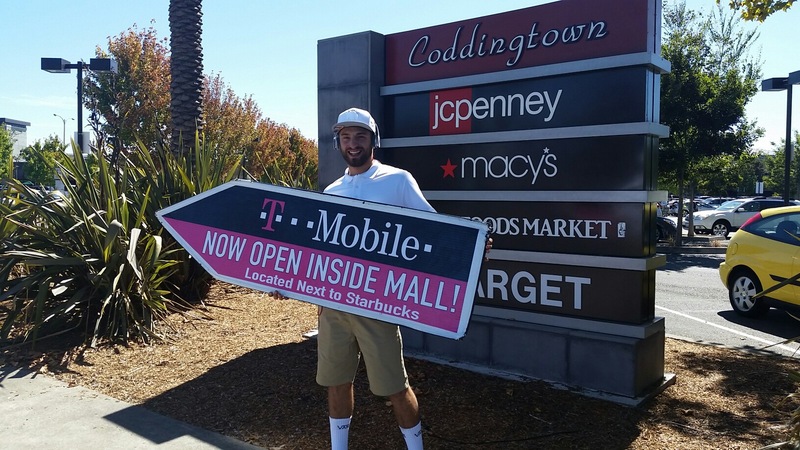 When it is finished you will have human directional signs that will allow you to improve sales and foot traffic in your location. All our signs are high quality coroplast and are designed to last. Call us today at 877.376.7379 and find out how we can help you meet your sales goals with human directionals. We all know how frustrating it can be to get lost. Bandit signs are 18X24” signs that literally point you in the right direction to get to your destination. This is great for Home builders who may be a bit off the beaten path. Let these signs fill in for precise directions when other forms of navigation are not readily available. Do you have a promotion going on in the near future? Bandit signs are the perfect size to help get your promotions’ message visible to every car that passes by. Call us today at 877.376.7379 to get more info. Inflate your sales with one of our massive 25’ ambient air balloons. Pick from hundreds of our different ambients in stock or have us personally develop one to your specifications. These highly effective advertising tools demand attention, and they get it. Watch your sales reach new levels with these attractive and enormous displays. Air balloon promotion will allow you to be more visible to a wider group of people with ease. This is a creative way to market your company or a promotion that you are running. This visual form of marketing is a great way to make people stop and take notice. Air balloons appeal to a broad demographic of people, meaning you can reach a greater number of people. Call us today at 877.376.7379 to get your air balloon promotion started! Many people think that aerial blimps are something only large corporations can use to market their companies. This is no longer the case. All Directions Media can put your business on a blimp! Here are a few things you should know about our service. The immediate visibility is the biggest benefit of these companies. Whether you are telling people to call now for specials or simply want to raise brand awareness, you will find that this is the perfect way to do this. You will also find that this is a PR dream come true. You will not only attract the attention of the people in the area you are flying over, but you may even attract the attention of the press. It can be an excellent way to start the buzz with your company. Another thing to keep in mind with this is that it is the perfect way to tie together the pieces of your marketing campaign. This is especially true with long term marketing campaigns that you have worked on for months at a time. The advertisement on the blimp will allow you to bring this altogether in a huge way that is sure to make the masses take notice! Currently we offer 14’ aerial blimps. We fly these large blimps up to 200 feet above the ground. This enables these floating advertisements to be seen from up to a mile away. Contact us today at 877.376.7379 to get a quote and find out how you can complete your marketing campaign with a 14’ aerial blimp. 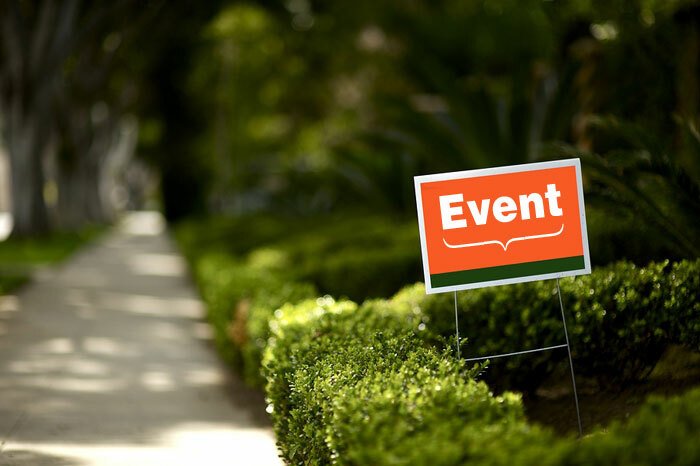 One of the most common forms of marketing is flyer distribution. This is an effective way to target large groups of people while keeping your costs low. You can let people know about the services you offer and even announce promotions and sales and stay within your marketing budget for the project. This can be a much more economical way to advertise than postcards. Call us today at 877.376.7379 for more information.